As the cost of utilities continues to rise, many homeowners are looking into making their residences fully dependent on solar power. As such, understanding the costs, benefits, and potential financial returns of moving to solar panel-power is extremely helpful and informative. In the United States the average household consumes approximately 4,600 kWh of electricity per year. This page covers some US prices, go here for the main UK solar panel costs info. However, continuously-running appliances or those that create a large drain on electricity (like hot tubs) will affect this number considerably, as will the months when an air conditioner is in frequent or continual use. In the United States, electricity costs vary widely by state (West Virginia costs as little as seven cents per kilowatt per hour, but rises to 24 cents in Hawaii). For UK users, Northern areas will consume slightly less electricity than elsewhere during the year (less in Northern Scotland than Cornwall, for example). But these differences are negligible and so solar energy remains a viable option for many households. The kinds of solar power systems used for United Kingdom residences range between 1 to 4Kw (kilowatts) and usually end up costing £2,000 to £8,100 pounds. However, the cost per watt (which includes parts, permitting fees, profit, labor, and overhead) has massively decreased in the last ten years. In the United States, in most states the price is between six to eight dollars per watt ($/W). As such, the cost of the actual solar panels themselves is only about thirty percent of total pricing (followed by operational and system balance costs, both at twenty percent). The average solar panel conservatively generates about ten watts per square foot, with a conversion efficiency rate of twelve percent. This translates into requiring about 100 square feet of solar panels for every kilowatt you want to generate. In order to maximize the output of your solar paneling, it’s also important to know how many hours per day you can expect sunlight, which varies widely based on location (for US users, examples are highs of seven to eight hours a day in Arizona, versus lows of three per day in Chicago). This will affect the size of the paneling, with more panels if you get more sunlight and fewer if you get less. So, assuming their electric bill costs £76.10 /month, with a per-watt cost of £4.95, the total cost for their particular system would only be £14,840.41. Further, they could receive various incentives and credits totaling over £7,001.63, making the actual total cost a bit over £7,838.78. (Since further credits, government incentives, and benefits can be received over time, the homeowner might actually pay even less than this.) With current FIT rates, homeowners can save about £266 per year. Homeowners are paid for the power they generate, whether or not they sell said power back to the grid. Given the FIT rate (which will vary depending on when they sign up for it and other factors, such as their EPC rating and the size of their array; those installing after January of 2016 will get a considerably lower rate than those doing so last year), you would receive about 4.39p per kilowatt, which equals about £61 per year based on a 3 to 4 kWh system. For the first year, this family would save an average of nearly forty pounds a month on electric costs (most months it would be higher). The threshold when savings exceed costs is called “payback time”; in this family’s case, they have paid back the total cost of their system after nine years and six months. It is important to determine how many panels can fit on your roof. 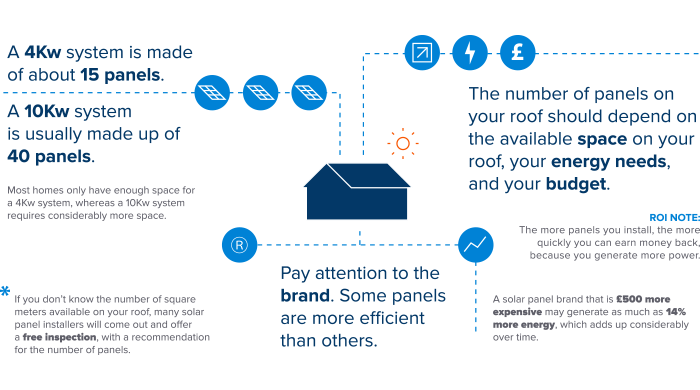 Most homes in the UK can only support a 4kW system, which equals around 15 panels. The more panels you have, you earn money back faster as your system will generate more power. If you are unsure of how many panels your roof can support, most solar installer companies will come to your home and do a free inspection, and can recommend the approximate number of panels. Branding is also profoundly important when considering which panels to buy. Higher quality paneling tends to be more efficient, which means they are able to produce more energy (sometimes up to 14 percent more), which will add up over time. As mentioned above, the actual solar panels account for approximately thirty percent of total costs (not including installation or operational costs). Panels suitable for residential use and covering a range of one to four kilowatts will cost anywhere between £2,000 to £8,100 (though some rate it higher at £5,000 to £8,000, assuming a VAT of 5 per cent). It is very possible to purchase high-quality panels without paying an unnecessary amount of money. 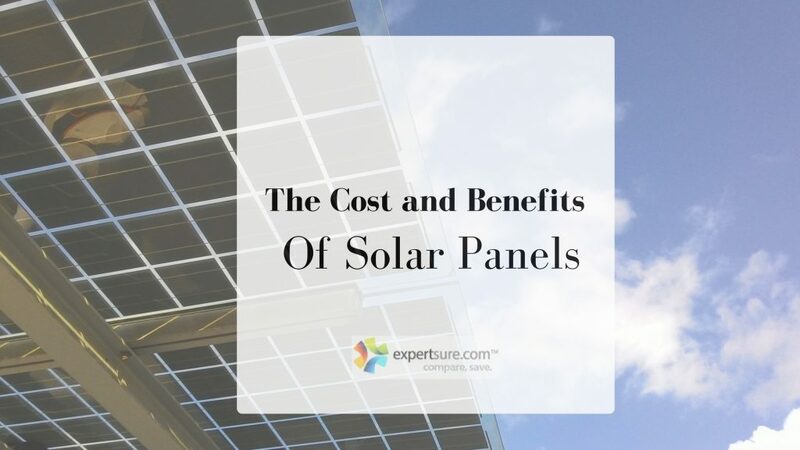 Ideally, homeowners should heavily consider cost per watt, which measures annual costs relative to the particular electrical output of the panel. Given that panels have drastically decreased in price over the last decade, most homeowners will end up paying about £1.14 per watt per panel. 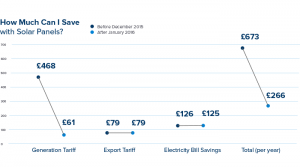 You can earn a tariff for each kWh of electricity your system generates, and you can also earn the same for every kWh you export. Since costs vary widely between installers and products, you should ideally get quotes from at least three companies before you decide which to use. This will help maximize the money saved and also ensure you get the most efficient, highest-quality solar array for the price. An inverter is a device which converts direct current (DC) from the solar panels into alternating current (AC), which is used by home appliances. By far the most common kind of inverter is a string or centralized inverter, which is the most cost-effective option in the United States. (The panels are arranged into “strings” which channel their energy into one inverter, hence the name.) They will need to be replaced before the 20- or 25-year solar panel warranty expires—this will cost you about £800 at current rates. This can be potentially delayed by using a micro-inverter (but this will also increase costs, along with higher power output and a lengthier warranty). Micro-inverters are becoming more popular among residential solar users, as they convert the energy at the panel level (in other words, right on the roof), without the need for a separate, centralized inverter. Because centralized inverters can malfunction or otherwise generate less power due to shading from trees and other objects, the immediate conversion of energy provided by micro-inverters is making them a contender in the solar market. The conversion takes place at each individual panel, which allows the flow of power to be smoother and faster. 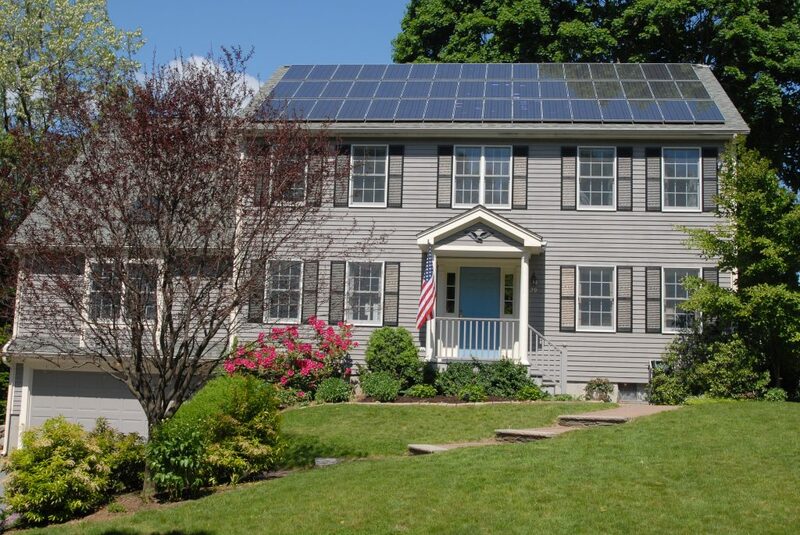 Additionally, micro-inverters also allow the homeowner to monitor the performance of each individual panel. As far as installation costs are concerned, these will vary widely based on county, as they include both labor costs and various permit and inspection fees. In addition, homeowners will need to account for the building and electrical permits required, any pertinent neighborhood covenant requirements, and approval from their local homeowners’ association, if they have one. It is best to choose a large and reputable solar installer, as they will likely be the most informed about all the permits and other hoops to jump through that are necessary where you live. Operational costs will include monitoring, repair, insurance, maintenance, and overhead costs, which make up about twenty percent of the total cost. This amounts to about $4,000 to $8,000 for US users. However, it is important to note that this is the area with the greatest potential for cutting of costs; not every family will need monitoring and most will not need a lot of maintenance, either. Mostly, you just need to make sure the panels stay clean and are kept free of trees or other objects which might shade them. UK users have an added benefit, in that if they keep the panels tilted at a fifteen-degree angle, rainwater will naturally wash the panels and ensure optimal performance. There are lots of incentives available for those in the solar market. As such the final total cost of your solar system is heavily conditioned on where you live and the rebates, grants, and text credits for which you qualify. Sometimes, it is possible to cut costs by up to fifty percent, making the total cost of solar energy even more affordable. 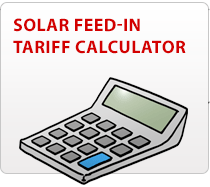 In the United States, every solar household receives at least a thirty percent federal tax credit; UK users must formally apply for the Feed-in Tariff program to be eligible for various government incentives. US users can search the Database of State Incentives for Renewables and Efficiency (DSIRE) to determine the incentives for which they are eligible, while UK users can contact Ofgem for a list of energy suppliers that are authorized to handle applications and payments for the FIT program. Since some incentives are capped at certain power or cost thresholds it is important to determine the system size for your home that maximizes these benefits. Your installer can help you determine this. In recent years, new models and options have surfaced to reduce or even eliminate the up-front costs of transitioning to solar power. These options include power purchase agreements (PPAs), third-party ownership, and pay-as-you-go. These models are by far the largest reason why solar power has become tremendously popular in recent years. Indeed, nowadays it is entirely possible for a household to switch to sola power for zero dollars down, and thus start saving money from the very first day. Leasing your system is a wonderful way to do this; instead of paying the electrical utility company to use their power, you lease the solar system, and simply pay a fixed rate for the electricity the system produces. Furthermore, the new electricity rates connected with leasing are much cheaper than traditional costs, and are also typically locked in for fifteen years—in stark contrast with utility rates, which have been rising steadily for decades. With concerns about the environment and the cultivation of renewable sources of energy being a very public discussion in our day, along with the ever-present concern of rising home maintenance costs in an uncertain economy, more and more homeowners are choosing to switch their households to solar power. With recent technological advancements and an increasingly competitive, user-beneficial market, it seems that for many families, making the switch to solar power may be one of the smartest decisions they could ever make.